When we arrived, BM Soho, a dirty little sweat box of a shop, was packed to the ceiling with young dubstep fiends, hungry for new beats and rhymes. Dub Police are good to their fans, and throughout the evening there was no end of free CDs, stickers and signed t-shirts being flung into the crowd from all directions, much to the delight of those packed in to the rafters. Headlining the celebration were Caspa and Rod Azlan, but before they took to the decks we were treated to a set from a couple of the label's rising stars, a mixture of one of The Others and one of Subscape. Displaying a good cross section of the label's talent, it was a pleasure to see the comfortable way they controlled the music. Though perhaps not the most exciting of sets, the bass was solid and they got the punters well warmed for the main event. Dubstep is founded on a strong principle of bass, and Caspa brought some truly tasty and fulfilling basslines that throbbed in our bellies. Bass growled under every track and drove the tunes forward. The powerful force emanating from the sub-woofer caused a chain reaction which made it impossible for the crowd's movements not to be taken over by the pounding vibrations. If anyone knows how to get a crowd going it's Caspa and the crowd was lapping it up. 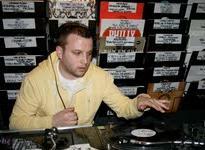 Where Caspa holds an edge over many of his competitors is in his partnership with Rod Azlan and other vocalists. Having a talent like Rod Azlan on the mic made Caspa's set a performance rather than a demonstration. Mixing up the timbres, Caspa introduced some Balearic trance high end to the bass to celebrate the start of the season in Spain. Whilst his set was in many ways a celebration of blissed out summer, he managed to keep his signature London style and the dirty bass balanced out perfectly with the euphoric highs. Towards the end of his set, Caspa dropped his new single 'Fulham to Waterloo', Dub Police's 50th release but, sadly, it was rather underwhelming compared to his back catalogue. Whilst certainly a solid release, it seemed too simplistic for Caspa and didn't have that extra edge he is known for. It seems that the 50th release just can't measure up to the party thrown in its honour.